Recreational boating is available throughout the Walt Disney World Resort in a variety of forms; from slow, relaxing paddle boats down the Sassaluga River to the heart-pounding fun of a Water Mouse. 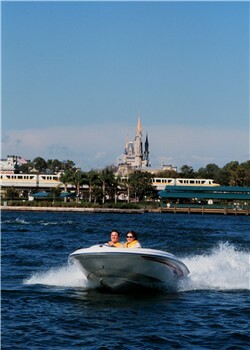 Sea Raycer --Guests can make waves across the Disney waterways aboard a personal Sea Raycer watercraft. The mini-powerboats can seat two people. At leas one person in the craft must have a valid drivers license.